Rectangle chocolate bar available in 3 sizes and flavours. Perfect to use as gift bars or even table place names. 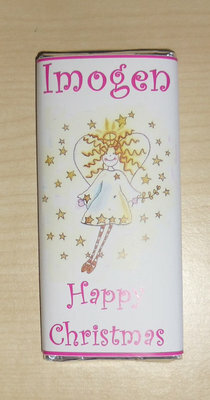 Names and/or your own message can be added to both the front and back of the wrapper. MILK CHOCOLATE - 40g, 100g or 200g size available. PLAIN CHOCOLATE - 40g, 100g or 200g size available. Please e-mail us on info@itsawrapcornwall.co.uk if you have any special dietary requirements as we may be able to source diabetic/dairy free etc bars.